Nectar flow stimulates brood rearing and the expansion of the colony population. This can be 100% natural or by supplemental feeding. Putting honey supers below a brood nest can for instance simulate a flow as the bees move the honey to its rightful (in their eyes) place. Bees in a cluster without brood will remain at a temperature of about 20°C, with brood the temperature will be around 34-35°C. Increasing their requirements for heating fuel. Insufficient autumn stores will often lead to spring starvation – after they have consumed all stored honey and there is a lack of fresh nectar. Active management will enhance the colony survival whilst judicious feeding with sugar makes it is possible to artificially stimulate a colony to breed, expanding its population in advance of a major flow. Honey: Is honey the ideal food for colonies requiring supplementation? Consider the following reasons why this is not a desirable food. Honey can harbour American foulbrood, European foulbrood, Chalkbrood, and Nosema. Nectar or sugar syrup has a stimulating effect promoting brood expansion, honey is a storage medium and so does not have this effect. Some feel that feeding honey makes the colony more defensive and aggressive. Hydroxymethylfurfural [HMF]), increases in concentration as honey matures / ages. Bees are more attracted to sugar syrup than they are to honey by a factor of two. Research has indicated that bees live longer on sucrose than honey. Honey is ££s per pound whilst sugar is pence. Organic Sugar: Chemically this is the same as white sugar, method of growing however makes a few changes to the residual components like ash. Bees seem to prefer sugars with a lower ash content. Organic sugar is also a premium priced product. White Sugar: Sucrose is the dominant sugar in nectar produced by flowering plants and used to attract pollinators. Thus white sugar is considered the supplement that will provide the least risk to bees in the form of digestive complaints, usually manifested as dysentery in bees. Raw Sugar: Sucrose with small amounts of molasses added to give it golden colour. The amount of the additives are very small and so unlikely to cause many problems to bees. Brown Sugar: Brown sugar is produced by the addition of molasses to refined white sugar. Brown sugar may contain up to 10% molasses. Gives bees dysentery. Molasses: This is unsuitable to feed to bees. For springtime colony stimulation or when queen rearing; feed small quantities (1–2 L) every few days of a 1:1 concentration of sugar and water by volume. For winter stores, 5 to 10 litres of 2:1 sugar:water weekly or until the colony has stored. Candy – granulated or powdered sugar made into a thick paste as an emergency supplement in winter early spring. Alongside the strength of the sugar, the rate at which it is delivered needs to be considered. Slow release having a greater stimulatory effect than a single large volume. There are a number of methods of feeding sugar to a colony. Sugar fed in a dry form can be used in an emergency. The sugar is heaped, perhaps ½ kg to 1 kg, on the inner mat of a hive. The amount given depends on the strength of the colony. 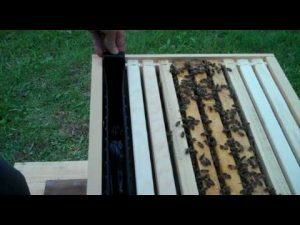 This method has been used to feed bees through winter when the colony is running short of stored honey. Feeding liquids in the form of sugar syrup could be detrimental for the colony as it may promote the circumstances by which nosema disease proliferates. Minimising hive manipulation during the cooler months reduces the incidence of nosema disease. Top feeders come in a variety of designs and sizes and are probably the main method of feeding quantities of sugar syrup to a hive. Various size buckets or jars with small holes in the lids are inverted over the top frames or a hole in the lid of a hive. An empty hive body can be placed on the hive and jars or buckets placed in this hive body. The lid of the hive is placed on the hive over the feeders. 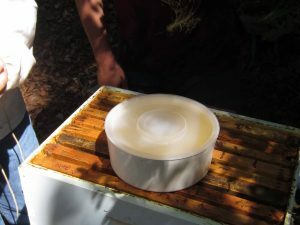 If syrup feeding is conducted on a regular basis some beekeepers cut a 5–10 cm diameter hole in the middle of a lid to enable easier feeding of colonies. Specially-made top box feeders can also be constructed to feed larger quantities of syrup to bees. Syrup can also be placed in various sized plastic bags, punctured with a number of small nail holes, and placed on the top bars. This is also a useful method for feeding syrup on an occasional basis. A jar placed on a special feeding frame at the entrance of a hive has been popular, but has some major restrictions. These containers are often referred to as Boardman feeders. They are only useful for very small quantities of sugar syrup in a situation where stimulation of a colony is required. They should be refilled each day if empty. These feeders may encourage robbing due to their location at the hive entrance, although this has not been my personal experience. Division board feeders are purpose-made frames that will hold syrup. They may hold only one to three litres but this may be useful in a queen rearing apiary where stimulation of the hive is desired. 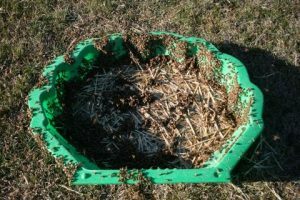 Unfortunately, the colony is exposed for the frame feeder to be filled; this may be very harmful to a colony of bees during cool or cold weather. An existing frame must be removed to place the division board feeder into the hive. Timber shavings, a wire screen or twigs should be placed in the feeder to prevent bees being drowned while taking up the sugar syrup. Open feeding in bulk containers has been used very successfully. The field bees require warm weather to be able to fly to the feeder. The open feeder should be placed as near to the hives as possible to encourage them to take up most of the syrup and not other bees in close proximity. The colonies with larger populations are likely to take up more syrup than smaller populated colonies. Mix up enough syrup for the equivalent of each hive in the apiary to consume one or two litres. Place an open clean vessel in the apiary. Pour the syrup into the container and place a layer of straw over the top of the syrup. This prevents the bees from drowning. If livestock (cattle, sheep) are present, then cover the vessel with a wire grid preventing the animals from drinking the syrup. There have been cases where cows and goats have died as a result of drinking sugar syrup. If there is any chance of rain, then cover the feeder. Light rain particularly may sit on top of the syrup and make the mix less attractive to bees. If all goes well, the feeder will be emptied within a day or two. Sometimes the bees take a day to figure out that the syrup is available. 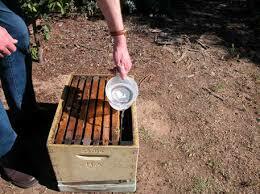 To speed up the communication spray a small amount of syrup at the entrance of each hive in the apiary. Some beekeepers have suggested that this practice makes bees aggressive. I have found the complete opposite with bees becoming very quiet and easier to handle. There is no evidence of open feeders causing any increase in pest or disease issues within the apiary or individual colonies. Bulk or open feeding is an excellent means of feeding an entire apiary without the need to enter or interfere with individual hives. There is also the added benefit of not having the extra expense of individual feeders for each hive. This is an extremely important issue when considering feeding bee colonies sugar syrup. The evidence suggests that honey bee colonies fed one or two litres of sugar syrup at a time are likely to consume all this liquid sugar and not store any of the sugar for any length of time. The use of small amounts of sugar syrup to stimulate bees on pollination jobs, for use in queen rearing systems, or to stimulate the colony in early Spring, should not pose any significant risk as far as sugar syrup being stored and at some future date extracted. Feeding larger quantities of sugar syrup does pose a risk of the sugar syrup being stored by the bees. and at some future date being extracted by the beekeeper. Feeding large quantities of sugar syrup may occur in autumn in preparation for winter or during periods of severe drought. In most cases the bees will consume the bulk of this stored sugar and the risk of extracting stored fed sugar will be minimal. The first extraction after large quantities of syrup have been fed to bees should be identified in the paper work sent to the honey buyer/packer company. This first extraction could be many months after the sugar syrup has been fed to the bees. While not feeding bees any sugar would be ideal, the occasional or seasonal use of this management process can be a lifesaver for the bees and can significantly enhance a colony’s performance.